Our Products >> .45-75 Win Ten-X H/S, 1 Cartridge not a Box, LIMIT1 ! One Cartridge, not a Box: .45-75 Winchester a.k.a. .45-75 Centennial by Tex-X Cartridge Company, using New Brass Cases by Ten-X with "Ten-X 45-75" HeadStamp and a 350 grain Lead projectile. Loaded to Black powder pressures, however, use only in rifles in excellent condition. The Winchester 45-75 Centennial cartridge was introduced in 1876 for the Winchester "Centennial" Lever-Action Rifle. It was discontinued by Winchester in 1935. I consider this one of the nicest looking cartridge ever produced. 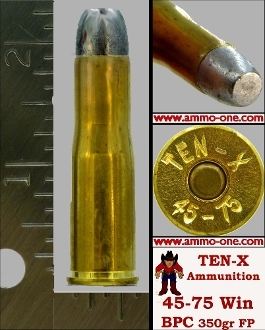 .45-75 Win Ten-X H/S, 1 Cartridge not a Box, LIMIT1 !